Any inflammatory condition of the liver is called hepatitis and there are many possible causes. 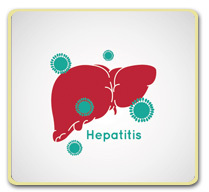 Hepatitis can be caused by infection, auto-immune disease, or a variety of toxic substances. The CDC estimates that there are around 60,000 new cases of acute infectious hepatitis in the US each year, and an estimated 4.3 to 5.7 million people in the US are living with chronic infectious hepatitis. Let's start by going over some basic information about the liver, then we will talk more about hepatitis and how it affects the liver. What are the possible causes of hepatitis? Infection - Infectious causes include hepatitis viruses A, B, C, D, and E. Mononucleosis and cytomegalovirus (CMV) can also cause hepatitis. Alcohol - Excessive alcohol consumption can cause acute or chronic forms of hepatitis. Toxins - The filtration and breakdown of toxins by the liver means the liver is at particular risk from toxins. Common chemical toxins that affect the liver include certain herbicides and a number of industrial chemicals. Medications - Several medications, both over-the-counter and prescription, can damage the liver, especially when taken in higher than recommended doses, or if combined with alcohol. Liver tests should be monitored when taking certain medications because of this risk. Herbs and Supplements - Many herbs can be dangerous to the liver, including aloe vera, black cohash, cascara, chaparral, comfrey, kava, and ephedra. There are many others. Higher doses are more dangerous, and children are at especially high risk. Autoimmune conditions - In certain autoimmune diseases, the immune system mistakes the liver for a foreign object and starts to attack it. This can cause acute or chronic hepatitis. The following symptoms come on abruptly with acute hepatitis, and more slowly with chronic forms. Hepatitis can result in acute or chronic liver failure, which can cause many other severe symptoms, and can result in death. Over the next few weeks, I will discuss several of the causes of hepatitis individually, in more depth. I hope this will provide important information to help you recognize the risks and potentially avoid chronic liver disease. If you have any questions about hepatitis, please log into your account and send us your question. We are here to help.